Traditional DB Plans promise Accrued Benefits. Cash Balance Plans promise lump-sum amounts. Which promise is easily understood by both owners and employees? There is no Non-discrimination testing for owner only plans. No Cross-testing either. Like the traditional DB, Cash Balance has the flexibility of funding within a range of minimum and maximum calculated by an Actuary. The owner can easily compare the hypothetical account balance to plan assets. At any given time, he can determine if he is over or under funded. Let me take you on a tour of an analysis of an owner only cash balance for a 31 year old owner with W2 Earnings of more than $260,000 He wants to contribute the maximum allowable. Note that in the first year, the 415 Maximum Lump Sum is $54,561. The 415 Lump Sum at age 62 is $2.5M. This is the same 415 Lump Sum Limit for a traditional DB Plan. 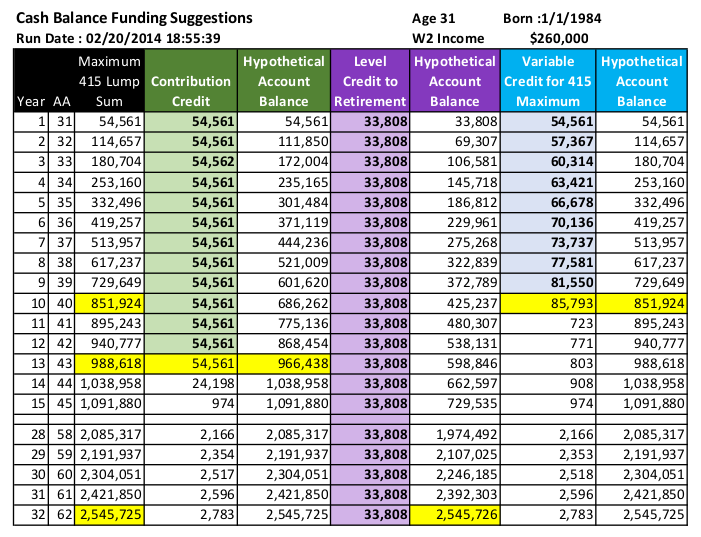 If we make the Pay Credit $54,561, then the 415 Maximum will be exceeded by the hypothetical balance in the 14th year. At this point you can reduce the pay credits or terminate the plan and roll over the cash balance account of $1M to an IRA. Hopefully, there it would grow at a rate higher than the interest crediting rate. We can have a level pay credit of $33,808 until age 62. It looks good and neat, but our owner wants to contribute the maximum allowable. Finally, let’s consider a Pay credit that provides a Cash Balance account as of the last day of the Plan Year that is equal to the maximum lump sum under Section 415 that can be distributed as of that date. That’s the column called “Variable Credit for 415 Maximum”. After 10 years, the pay credit must be reduced considerably. It may not pay to maintain it. Again consider terminating the plan and continue with a maximized 401(k)/ Profit Sharing plan of $57,500. A combined Cash Balance and Profit Sharing/401k plan for a 30 year old can have a total contribution of $87,661 in the first year. 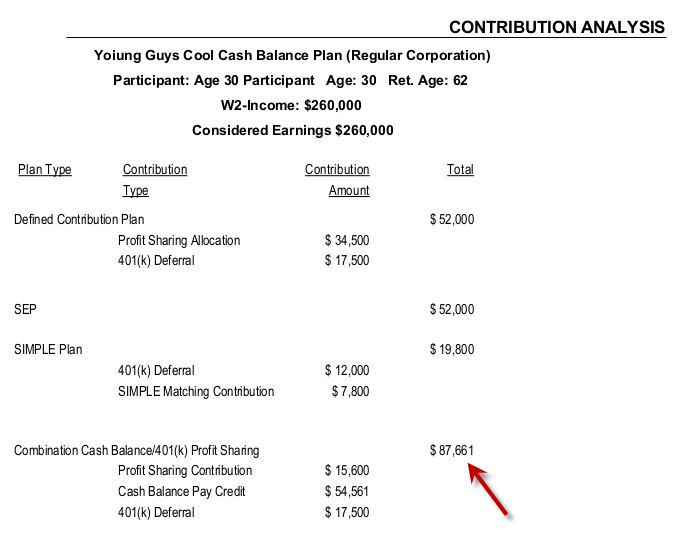 A Cash Balance plan is still good even for a 30 year old.